IN THE 18TH CENTURY, Japan boasted two capitals: Edo (later to become Tokyo), seat of the military, and Kyoto, where the emperor and his court exercised a largely ceremonial role. Freed from the onus of imperial duties, Kyoto developed a new business class with money to spare on patronage, and an adventurous arts community to put that patronage to innovative uses. Flexing his expressive urges, Nagasawa Rosetsu (1754-99), a so-called "eccentric" artist, took his experiments as far as ink painting with his fingers and fingernails, creating Hero Playing a Flute, a hanging scroll distinguished by the playfully loose and runny ink washes. With melty haunches, a quizzical ox bears a fluffy-haired youth noodling on an extra-long bamboo flute. An impressive sampling of Rosetsu's astonishing works, along with those of seven other artists, is displayed in Traditions Unbound, the second half of a two-part exhibit at San Francisco's Asian Art Museum. Rosetsu had a keen eye for animals, as seen in a six-panel folding screen (a favorite format for Kyoto artists) depicting three meditative monkeys sitting on a rocky redoubt. Two of the monkeys stop to stare at the viewer, while the third leans over a miniwaterfall rilling through the shallow crags. The stones are decorated with delicate swags of red and blue-green ivy leaves. Even better is the large panel of a single macaque seated on a chunk of slate-colored rock jutting out into a pure picture plane fashioned from heavily patined gold-leaf squares. The exuberant curved strokes that create the shadows on the rock contrast with the detailed, minute lines of the monkey's shaggy pelt. This wise, wizened primate seems to offer an infinitely sad, knowing rebuke to human presumptions. Equally adept at teasing out the secret life of nature is another eccentric, Ito Jakuchu (1716-1800), whose paneled screen titled Vegetables is a graphic revelation. Jakuchu's mushrooms, taro roots, eggplants and melons are immense forms floating in space like looming, living planetsso big that their bulging curves extend into the imaginary zone outside the rectangular borders of the panels. Using gradations of black and gray by diluting his ink washes, Jakuchu fashions earthy forms so alive that they seem to ripen in front of one's eyes. It is not a surprise to learn that Jakuchu's family was in the grocery business for generations. 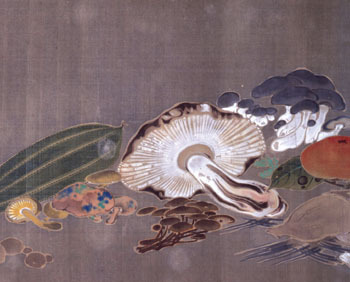 At a different end of the scale, Jakuchu's long (about 40 feet) handscroll Compendium of Vegetables and Insects, reading from right to left, portrays fruits and veggies. After leaving the plant world, the scroll tracks across a miniature landscape of moths, grasshoppers, caterpillars, tadpoles, chameleons, dragonflies and a scarab-green tree frog. These tiny creatures who exist almost out of sight beneath our feet are captured with a precision befitting an entomologist and yet rendered with the jauntiness of a freehand sketch. The delicate scroll is unrolled only about six feet at a time and never seen in its whole, adding mystery to its visual appeal. The other artists in the showSoga Shohaku, Maruyama Okyo, Ike Taiga, Goshun and Yosa Busondon't arrest the eye quite so intently. Goshun's four-panel Moored Boats is perfectly balanced in its asymmetrical array of bulbous, single-masted vessels at rest in the faint ripples of an almost invisible harbor. Buson's pair of six-panel screens conjures up a landscape of granite outcroppings with villages tucked between the stony foldsall done with light impressionist daubs. The air of autumnal solitude is greatly enhanced by the worn silver-leaf background. From the February 1-7, 2005 issue of Metro, Silicon Valley's Weekly Newspaper.